Lately, Dragonfly has become very interested in calendars and knowing when something is going to occur. I think it may be related to her recent birthday. Her interest got me thinking about starting "calendar time" next school year. 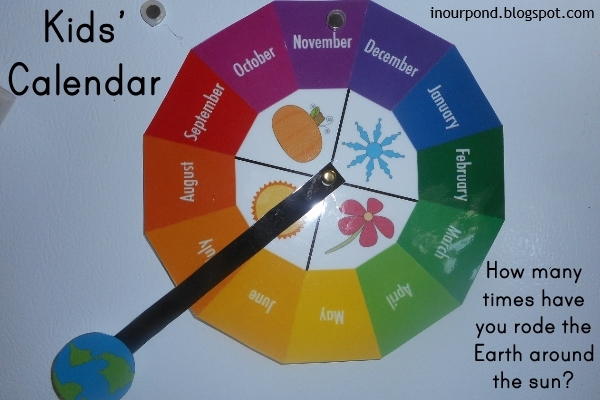 As I was researching (Pinteresting) and creating our calendar time, I began to tangent toward other types of calendars. First, I got the crazy idea to make tiny magnetic numbers for our fridge calendar. 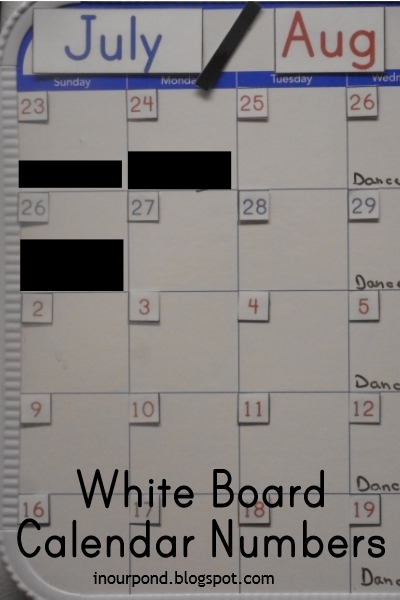 I was mostly done with the project when I realized that our fridge calendar wasn't magnetic. So, my tiny numbers are stuck on with "teacher tack." The numbers are in two different colors so I can keep a perpetual calendar. As one month passes, I begin sticking on the next month's days. As you can see in the picture, July is blue and August is red. Then, September will be blue again and on and on through the year. It may seem silly but I really like the way it looks. Last week, I got out this "Kids' Calendar" that I had made a few months ago. The main pieces of it came from Mr. Printables (the months). Montessori Method teaches kids that their birthday is equal to the amount of times that they've gone around the sun. I really like that concept, so I made this kids' calendar to emphasize the point. With Dragonfly nestled beside me, I put the "Earth" on July and said "This is the month you were born." Then I moved it all around the circle, back to the July space and said, "Now, you are one." We went around again- "You are two." All the way up to age 4. I'm planning on moving this calendar to our school time so that we can see together how the year adds up. I've had several people ask me for a printable of the monthly calendar. I don't feel like I can share it with you since the colored pieces came from Mr, Printables (here). I cut and manipulated the pieces on my scrapbooking program, but the same thing could be done with scissors and glue. 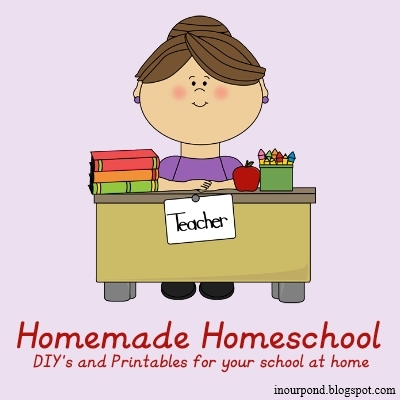 The seasons came from My Cute Graphics, but you can also find nice realistic set on Montessori for Everyone. I'm sorry for the inconvenience. Here are two more types of calendars. 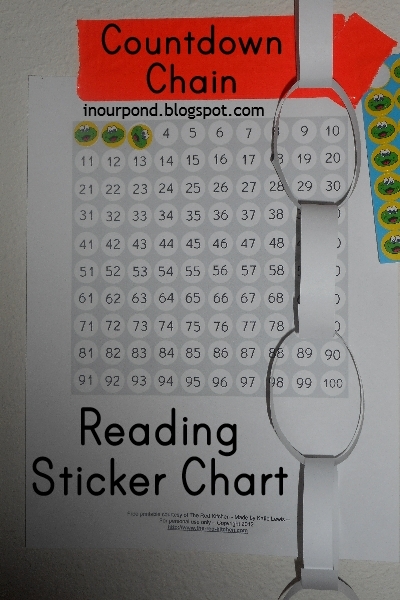 The 100's chart (from here) is counting the number of days that we've done our reading lessons. On Dragonfly's birthday, I started the "How to Teach Your Child to Read in 100 Lessons" book. She's doing very well and is very excited (in fact, she can hardly sit still), but I thought a progress chart would be helpful to both of us. She looks at the chart several times a day and is very proud of her work. I also worked on the calendar time materials this week, which I'll write about at another time. I guess the birthday reminded me of the passage of time. I hope these many calendars will be inspiring. Question: What kinds of calendars do you use?